In 2007, WomenSing began a process that resulted in what we now know as Youth Inspiring Youth — Commissioning Emerging Composers (YIY). The project excels in engaging the talents of young composers to create the next generation of exciting music for women’s voices. The central YIY concept is collaboration. WomenSing holds an annual competition to select one or two talented young composers to write a new composition for women’s chorus. We then bring in established composers to mentor and guide the winners. The text for the new work is a poem from River of Words (ROW), a project co-founded in 1995 by writer Pamela Michael and then-US Poet Laureate Robert Hass. ROW helps children around the world to create poetry and art that expresses their hopes and concerns for the environment. ROW is now a project of The Center for Environmental Literacy at St. Mary’s College in Moraga. 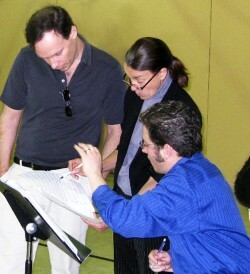 Martín Benvenuto, Libby Larsen, and Joshua Fishbein discuss the score of “Unseen Secrets” at the 2010 Composers’ Workshop. This month, WomenSing announces the 2013-14 YIY commissioning competition. It is open to California composers between the ages of 18-30. Competitors must submit an original work composed within the last three years for chorus and three to five minutes in length. Their deadline is April 8. The winning composers will be announced in June. After that, the composers work on a tight schedule. They have two months to select their poem and another three months to prepare a draft composition. They are guided and mentored by both a Teaching Artist and an Advising Composer. Our Teaching Artist is Libby Larson who is one of America’s most performed living composers with over 400 works ranging from intimate vocal works to symphonies and operas. Our Advising Composer is Cristian Grases, a experienced conductor and composer with a particular expertise in Latin American choral music. For each composer, the process culminates with the work’s world premiere at a WomenSing concert. Festivities include a pre-concert talk by the composer and a celebratory reception after the concert for the composer, chorus members and audience. 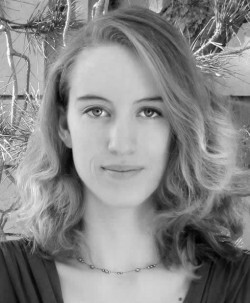 The workshop for the composition by 2012-13 winner Julia Seeholzert akes place on April 20 at St. Mary’s College in Moraga. The premiere of Julia’s composition, which utilizes a poem in Spanish, takes place at WomenSing’s Southern Exposure concerts on June 2 in Berkeley and June 5 in Lafayette. Julia will give a pre-concert talk at both concerts; the special reception occurs after the June 2 concert. Julia’s piece is the ninth YIY commission. Three of these wonderful works are performed on our new CD Songs from the Old and New World. They are Unseen Secrets (2010) by Josh Fishbein, Wit and Fright by Ryan Harper (2009) and A Precious Pearl (2011) by Lauren McLaren. Youth Inspiring Youth—Commissioning Emerging Composers may well become a national model for choral groups. In 2010, WomenSing and YIY received the Chorus/America/ASCAP Alice Parker Award which recognizes one chorus each year for programming “significant recently composed music that expands the mission of the chorus and challenges the chorus’s audience in a new way.” In 2011, we led a workshop on the program at the Chorus America national convention. Several attendees expressed interest in building their own version of YIY. The results of the 2013-14 edition of Youth Inspiring Youth will first become known to the public at a free workshop performance on April 11, 2014 in Lafayette. The world premiere takes place the following June. Stay tuned for another adventure in creativity!